Yes, I know I am a bit late. Festivities are over and everyone is back to their own routine with new targets and resolutions. However, I had to write about the festivities which gets most people in the happy, celebration mood whatever religious background or beliefs they have. Everywhere around the world holiday mood begins with Christmas and ends with New Year celebrations. Parties, holidays, fireworks, decorations, special food, presents… the list is endless. I have experienced Christmas festivities in England. What I remember the most are precious moments with family. Though it did not snow during that time, the scene of dark nights with bright blue lights sparkling from every home. I remember my cousins sprinkling the table with Christmas confetti and laying out Christmas crackers for us when they invited us for brunch. It was the first time I had tasted mini mince tarts. And the best part of Christmas day was making a jigsaw puzzle with the family as we use to when we all lived in Nairobi. During my first Christmas in India, I was baffled at the decorations in the shops and malls. Years back no one really noticed when Christmas came and went in India. Now its totally different. I love the huge classic really tall decorated Christmas tree at the Leela Bangalore. Haven’t seen a better decorated tree. Also they have a beautiful gingerbread house created every year which you can actually walk into. Also special memories of my daughter bringing home a lovely chocolate cake with Christmas decorations for my hubby’s birthday. Yes its on 25th December.Christmas. In Mombasa is a not much different. Sunshine, beach, cocktails. The whole town is bustling with more people. Fancy dinners and deals, beaches are full of people and yes decorations at the hotels, shops and the mall. What amuses me most is the mechanical Father Christmas that Nakumatt places at its entrance. Every time someone passes it begins to do a jiggle and sings we wish you a merry christmas! Christmas in Dubai was a unique memory for us. Hubby and I experienced a proper Christmas party with my daughter in law and her family. Christmas stockings, Christmas cakes, cookies, chocolates, turkey, pasta for the vegetarians, champagne, starters, limoncello, oranges, whiskey and the hightlight — presents. Dubai in no way lacked the festival look with decorations, Christmas trees and gingerbread houses. Do you have special Christmas memories? 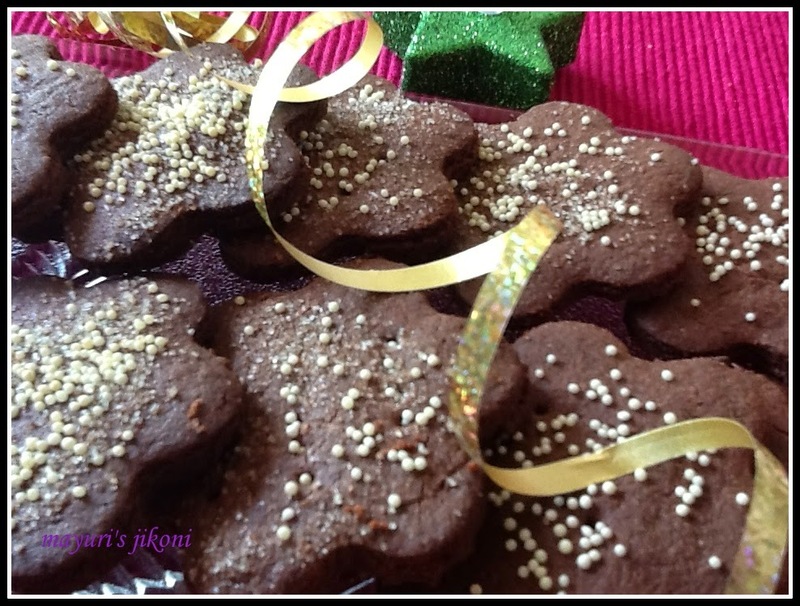 Here’s another recipe I had prepared during Christmas but didn’t get the time to blog it. Grease baking trays lightly with some butter. Mix sugar and orange zest together. Rub the zest into the sugar to release the essential oils. Sieve flour cocoa and salt together. Cream butter and sugar together till its creamy and fluffy. Add vanilla extract and orange juice. Add the flour mixture and form a dough. Roll the dough to about a ¼” thickness using a cling film or parchment paper. Cut into square cookies or any shape you desire. Place the cookies on the prepared tray. Sprinkle with sugar or sprinkles or nuts. Bake for 12 -15 minutes or until edges become crisp. The cookies were a bit bland so I dusted it with icing sugar during serving. Next time round I will add a bit more sugar and reduce the cocoa by a tablespoon or two. If the dough gets too hard add 1-2 tbsp of milk or orange juice. Can drizzle the cookies with white glace icing or melted white chocolate. I used salted butter. If you use unsalted butter then add ½ tsp salt instead of ¼ tsp.